Sacre causes scandal, AGAIN! Just like at the premiere in 1913, when catcalls and near-riot conditions erupted, Stravinsky’s iconic work is still causing tidal waves of controversy over a century later. My colleague Martin Grubinger and I have been notified that the Stravinsky estate will not allow our upcoming performance of “Sacre” in the adapted version in Europe, due to a potential infringement of copyright. We are very disappointed to learn this news, but have to respect their wishes. Unfortunately this means we have to cancel our upcoming performances in Dortmund and Luxembourg. The concerts in Ann Arbor and at Carnegie Hall in New York will go on as planned. We both deeply regret the position of the Estate and Publishers, but look forward to performing together in North America very soon. The families loss. Yuja Wang is a wonderful pianist. Sorry to hear! Sounds like a wonderful concept. Why didn’t the estate sign a license agreement well in advance before performances of the arrangement were contracted? Maybe there is something missing. Is this an arrangement under copyright? Is there a worldwide agreement for performances of this arrangement signed by the estate or per performance? Hope it gets ironed out for future performances and for perpetuity. How often have you heard of concert program changes due to copyright issues? LOL. Perhaps the Stravinskys require more clothing material in the Spring (or any other season). I was just waiting for some snark from you. When there’s nothing worth saying . . .
I’m pretty sure the old dudes made sure she’s piously clothed. Doesn’t Martin Grubinger learn by experiences he already made? In 2013 he already was to play his adaption of “Sacre de Printemps” when the Stravinsky heritages didn’t allow him to play it in public. Mabye he should have checked with them again before selling programmes including “his” Sacre to promoters again. I’ve heard Yuja play Beethoven’s Sonata Op. 106. Let’s just say I wish Beethoven’s family had an estate that could her from playing their works. Play them better than she does. While I disagree with Jackie’s original comment, your answer is perfectly worthless. One is entitled to like, or dislike, whatever one pleases, regardless of one’s ability to perform better. People at all levels of culinary, musical and artistic skills are allowed to have and express opinions on all restaurants, dishes, musical pieces, performers and performances, visual arts and visual artists; you are, of course, allowed to disagree, but the argument that someone must be skilled to hold an opinion on something is ridiculous. The problem may be that the Rite, at least according to IMSLP, is still under copyright in Europe (and Canada) as the term is lifetime + 50 years if not more. But since Sacre was written before 1924, which is when the US changed their copyright terms, it is public domain in the US. Therefore, Wang and Grubinger have permission to perform in the US but not in Europe. There’s treaties and such that I won’t mention as I’m not an expert on the subject. On another note, Michael Tilson Thomas did a fantastic podcast on Stravinsky’s copyright problems (hint: why are there three Firebird suites?). It’s not available on his website, but if anyone else can find it, let me know as I’d love to hear it again. Ms. Wang should be able to perform any piece of music she wishes because she is only performing music, not stealing. The Stravinsky’s should be flattered instead , seeing that Ms. is one of the 3 or 5 greatest living pianists.The ban is stupid because art was meant challenge us and thuja does just that. There are laws in place to protect composers’ estates. It’s worked like this for many many decades; none of us musicians are allowed to break said laws, so I don’t know why Wang and Grubinger should be able to just because she’s really famous. The ‘right to authorise public performance of a composition’, which is given to composers in all WTO countries (meaning over 180 countries), is based on the belief that performing music without the composer’s authorisation IS stealing. You are entitled to your contrary view, but I would point out that only a handful of pirate jurisdictions would agree with you. This is a good attempt at figuring out the copyright status here — yes, 1924 is a key date — but the reasons are all wrong. The US changed it’s copyright law in 1998, not in 1924. At that time, it imposed the world’s longest term of copyright protection, giving composer’s a term of protection lasting for 95 years after the death of the composer. Stravinsky died in 1971. So (most of) his works will not fall into the public domain in the US until the year 2066! Irving Berlin’s heirs have even more reason to celebrate! He lived to be 103. Anyway, in Europe they will lose copyright protection in 2046). There is an exception though for works published before 1924. This is because the 1998 Congress did not believe that it could constitutionally invest copyright in works that were then outside the existing term of copyright protection, which was 75 years from the date of publication. Le Sacre was published in the US in 1921. It fell into the public domain in 1996. The 1998 law, extending copyright, was thus passed two years too late to protect Le Sacre. But it does provide decades of further copyright protection to all later works of Stravinsky. the AFM, and the British Musicians Union in London. Frank, it seems to be about making an unauthorised arrangement. Of course ‘strictly live’ performances are violations of copyright if they are performed without the composer’s permission. In the USA especially. The US Supreme Court recognised this as long ago as 1909 in the case of Victor Herbert v. Shanley, in an opinion by the legendary Justice Oliver Wendell Holmes. Copyright law operates to protect legitimate financial interests for the entire term of copyright worldwide. The term of copyright may differ from territory to territory. The second one of those is identified as an adaptation BY Stravinsky which i presume doesn’t have a Stravinsky estate copyright problem. Probably most of the others are too, or they are so low-profile that they got away with it. 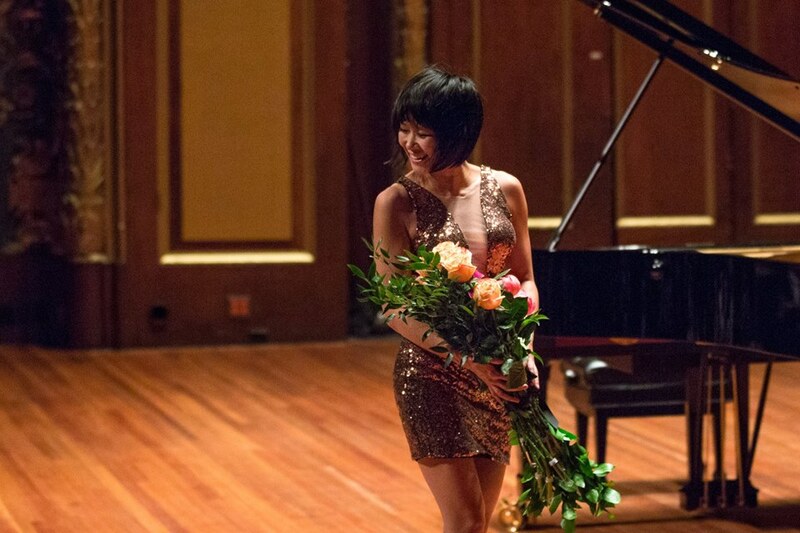 Perhaps Yuja Wang should examine her tasteless approach to performing and the offensiveness of it rather than blame someone else for turning her down. And for them to turn down the money is a huge statement. Surely they gave specific reasons? Will somebody please buy her a long dress. You failed to watch her performing the first Brahms with Gergiev and the MPO in Munich – in a beautiful long one. Prejudice is so hard to weed out. Who cares . There are tens of thousands of superior works to play. Good for them. Respect for copyright! I get copyright issues. while complicated and at times internecine they generally get worked out if some money moves. What I don’t get are comments and critiques of Ms Wang’s wardrobe. Can one actually listen to her play and think about how tastefully, or not, she is dressed according to THEIR standards? Seriously? What’s not clear here is what “the adapted version” is. There’s a published piano duet version by Stravinsky which I’ve heard in concert – and performed in concert myself – but any other arrangement would be subject to permission from the estate, just as it would be with any work in copyright. So if they’ve made their own arrangement without permission, the estate is 100% in the right. Perhaps Wang could clarify. From the original statement, note that the copyright issue for the arrangement (which the original copyright holders also “own”, because it is a derivative of the original) appears to be for Europe, not the US. (1) When I watched her play, the phrase being yelled out from an inmate while Jodie Foster walked by his cell, in the “Silence of the Lambs”, kept creeping in my head. Nuff said about her wardrobe. I stopped attending her live performances years ago. Served me well with just her CDs from local library once every blue moon. Add that to the loyalty deal, the Stravinsky estate isn’t to blame. YW’s “transcriptions” of classic piano works have big fire but no meat. All the dyspepsia around Yuja Wang makes me fear for the future of classical music, with its ~1% share of all album sales.